Made in London by Henry Hughes & Son Ltd. Stores reference 6B/108. Circular white metal instrument. 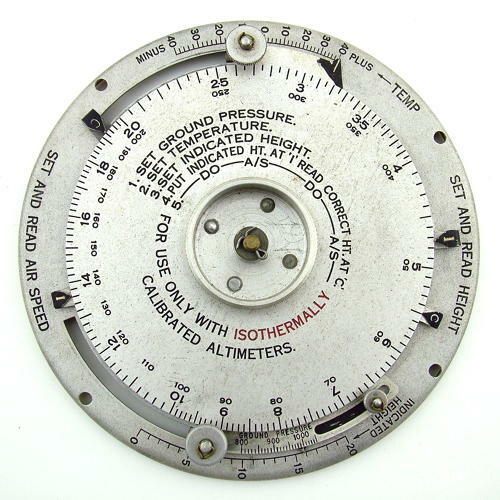 Has rotating discs for setting the ground barometric pressure, temperature, indicated height and airspeed. For use with isothermally calibrated altimeters. Used by Navigators when plotting routes etc. Well marked early example dating from 1940. Predates the more commonly found MK.II & IIA. Super condition. With box for this model but by a different manufacturer. Stock code M20434.